I've had some interesting conversations with some uber-smart people lately. The question we have pondered together is "why is our church shrinking?" In some cases, the conversation has centered around a local congregation. In others, we are talking about shrinkage in mainline denominations. I used to think that their only lure was theology. The evangelical / pentecostal / conservative Christian perspective deals in absolutes - right/wrong, black/white, saved/unsaved, gay/straight, etc. Lots of people (especially Americans) want hard and fast answers to their problems. The dialectical tension offered by Lutherans only makes their lives messier in that sense. However, I wonder if it isn't just their theology that is attractive. They are able to tap into genuine emotions of joy, fear, contentment, sadness, and hope that left-brained Lutherans will talk about, but are often unable to authentically stir up. I invite you into the conversation. Do Lutherans (and other mainlines) suffer from a lack of emotional spirituality? Are we exalting the benefits of intellectualism to the neglect of our raw feelings? Is it a problem to favor "smarts" over "hearts"? A major component of most youth ministries is service. Typically, these are lived out in 7-10 day trips in the summer where the most faithful, most active, church-going youth go into an impoverished community and do a bunch of work projects. These are good things. The church where I work does this each year. It's an essential piece of our ministry puzzle. What if, instead of taking groups on a mission trip we equipped young people to do service with groups they are already a part of -- sports teams, music groups, academic clubs, groups of friends, etc. What if our "evangelism" was not about giving testimonies or distributing tracts, but was instead about giving young people the tools to engage their friends in acts of lovingkindness? What if churches not only sent young "missionaries" out to their peer groups, but helped generate resources for these projects; including, but not limited to fund-raising, training, and post-trip decompressing? How would changing the way your church does short-term missions trips actually change the way your church does church? Almost everyone in the Sunday morning pews dress nicer than me. It's not because I don't like to wear nice clothes (I do). It's not because I can't afford it (I own lots of suits and ties). It's not because I'm lazy (well, maybe a little bit). I wear jeans and a sweater most Sundays. In the summer, I wear shorts. By contrast, almost all of the men at church wear collared shirts, if not a jacket and tie. We are a rather traditional congregation in the fashion sense, filled with people - young and old - that tend to wear their "Sunday best" to church. Several women rock bonnets from time to time. The ushers are expected to wear suits. Dresses (or skirts) and high heels are common for women. I must say, we're a good-lookin' group of Christians. I have no problem with people who choose to dress this way. In fact, the rest of my family usually looks rather dashing while we're in worship. So why the slacker mentality when it comes to attire? About two years ago I realized that most visitors who didn't have a previous church home were showing up in casual clothes. In fact, I recall a conversation with a would-be member who apologized several times after worship for being under-dressed. I was sad to know that she felt she had done something wrong by not showing up in a nicer outfit. I envisioned her walking into the sanctuary and surveying the room, as any visitor would do. She'd look for people she knew, what the stained glass window meant, where the organ was, and why the pastors had robes on. When it was time for communion, she saw a congregation filled with well-dressed people; and she wasn't one of them. As she walked up to the front to receive the sacrament, she wasn't focused on Christ's body and blood poured out for her...she was worried what people thought of her ensemble. I'm not convinced that Jesus had a dress code or that Christian worship requires fine clothing. I think it's great if some prefer to look really nice for worship, but it's also alright for people (especially visitors) to feel comfortable. So if someone comes to our church in casual clothing, they will likely find at least one other person looking the same way...but with redder hair. What about your congregation? How do the fashion choices of the worshipers convey certain assumptions about Christian worship? 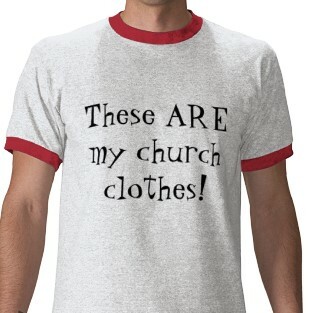 What kinds of clothes should people wear to church? What changes are in order to accomplish these tasks more faithfully? Needless to say, we have our work cut out for us. The task force is an amazing group of people. I am excited to see what will unfold in the next 18 months. A major focus in the early stages of our work has been to develop a communication strategy; in essence, letting people know what is being discussed in our meetings. Words like “transparency” and “openness” have prevailed in our conversations. This is a very good thing. The task force not a top-secret committee that will lock themselves in a room and emerge in 2011 with all of the answers for how to "fix" the ELCA. The task force values open dialogue with the whole church about our eco-system. The challenge is – how do we do that? It is my assertion that the information gap hasn’t been this wide since the days when Guttenberg rolled out the printing press. We're told that newspapers and the nightly news are dying, and yet many people rely on the daily paper and network broadcasts as their only sources of information information. Others look to blogs, social media and Jon Stewart for their news. The millions of people on Twitter and Facebook digest and regurgitate new information by the minute. This is in stark contrast to the millions of people who don’t even know what “a Twitter” is, let alone have any interest in finding out. Today, in the midst of a conference call, I began to wonder if the way in which we go about communication is as important as the content we are sharing. If we are able to create a structure that engages people across all print and digital mediums, might that be so uniquely profound that we don’t need a “communication strategy” (other than a competent secretary at our meetings)? Perhaps HOW we communicate is just as crucial as WHAT we communicate. If a tree falls in the forest, and nobody is able to hear it, does it make a sound? If a task force studies the eco-system of a denomination, and nobody knows about it, does it really matter what they produce? Ultimately, we’re not just talking about a communication strategy, we’re talking about an engagement strategy. How do we engage members of our church in the same conversations the task force is having? How do we honor the opinions of the faithful in an age where everyone is speaking a different language? And, what do we do with this feedback once we receive it? Within a few weeks, the task force will unveil a web presence, which will help answer some of the questions above. In the meantime, feel free to share your suggestions for how the LIFT / Ecology task force can engage the entire ELCA in this important work. I've been keeping my eye on the creative work that sparkhouse has been doing in the past several months. Some of my good friends work at the house. They are amazing writers and developers with a big imagination. Bethany recently sent me a note that got me excited. I want to let you know one more exciting thing about ReNew Vacation Bible School! You empower kids to change the world. We donate 5% of all ReNew VBS sales. Together, we provide fresh drinking water for 3,000 people for 20 years. One Day's Wages is also setting up a page on their website that will have more info about our partnership and track the donations. This is a simple way for a publishing group to invest in the spirit of the products they create. (In this case, ReNew is being pitched as "The Green VBS".) It's also an opportunity to make a difference in the world while selling curriculum. It makes me wonder what kinds of small-but-meaningful projects our households, businesses, schools, and churches could commit to...and, more importantly, how they might change the world in doing so. Do you know of any inspired organizations that engage in this kind of partnership? Share them here! Nearly everyone does year-end lists. Most of them are incomplete or inaccurate. With that in mind, here are the seven stories that intrigued me in 2009. 7. Honor Flights -- thousands of Iowa WWII vets take trip to Washington D.C.
What stories captured your attention and imagination in 2009? An old adage states that the three most important factors in buying a home are "location, location, location". Perhaps the same could be said for where church workers spend most of their time. After wrestling with this for years, I'm slowly coming to the conclusion that a church building may not be the best location for church employees to do their work. For some, this realization is nothing new. They have rejected the need for a church office and choose to spend all of their time in the community. For others, this sounds like another excuse for lazy ministers to have little accountability while sipping expensive coffee and calling it "work". For me, it's somewhere in the middle. Of course, we can't dismiss the importance of context. The "location dilemma" has many factors. For example, if someone is a solo pastor in a small town where church doubles as a community center , they might be best served spending the bulk of their time at the church. Conversely, if someone is a youth minister on a big staff at a downtown church in a big city, they may be better off hanging out in coffee shops and restaurants than being one of several people at the church. Then again, maybe not. Unlike some other cultural shifts in expectations of ministers, it seems the answer to the location dilemma is entirely context-specific. The church where I work as a youth and family minister has around 1,000 members. We are the only ELCA church in the Des Moines area that includes the name of the community in the name of the church - Windsor Heights. However, only 2% of our members live in that small suburb. In terms of youth & family households, about 30% live in Des Moines, 65% live in surrounding suburbs, and about 5% reside in Windsor Heights. For a variety of reasons (including a brutal 25mph speed limit on the main drag) only a handful of these people find themselves near the church, aside from attending specific church functions. The occasion where a non-staff person would knock on my church office door unannounced is rare (unless an adult small group needs help setting up the DVD player or moving chairs around). What do you think? Should church employees spend most of their time at church? What factors should be a part of that decision? If you are in church work, where does your most meaningful ministry take place?